I tried the Rare Minerals moisturizer by Bare Escuentuals and I thought it was not bad at all. It did leave my skin with a moisturized feeling, it wasn't dry moments after applying it, so that's always a good thing. It is supposed to contain "virgin soil" which is composed of active minerals that keep the skin looking healthy and bright. It even claims to reduce the appearance of pores. I can't say this is the beat moisturizer ever because it's not, but it is pretty good. I don't know if it's working its magic at the deepest level of the my skin but on the surface it's working for me at this time. The full size product is priced at $32.00 for a 1.7 oz tube. On Saturday I strolled down the dvd aisle at Target and my eye caught sight of my future husband actor Boris Kodjoe on the cover of a DVD. 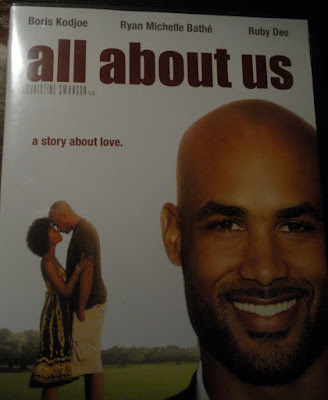 I had never heard of the movie "All About Us" but I decided to take a chance, a $12.99 chance, and I just hoped it wasn't a stinker. This 90 minute film is based on the true story of a young couple struggling to realize their dreams while keeping their heads above water. The film was so simple, sweet, and truthful. It is a film that drives home the importance of fighting for your dreams while keeping your priorities in check. I thought it was beautifully shot. If you can head to your local video store I would recommend you rent/buy this film. Maybe I am just at a point in my life where I value movies that highlight the more important things in life so that may be why the film impressed me. Nevertheless, I was not disappointed and I am happy to add this flick to my limited dvd collection. This couple created the award winning film "All about You". The diet is still going well. I am in Phase 2 which lasts for 3 weeks. In this phase I will do everything that I did in phase one except I am supposed to increase my workout time by 5 minutes (35 minutes now) and I can eat meat. The meat must be lean and I can not consume more than 4 oz at a time. And you are only supposed to eat each type of meat once a day, so I can not have chicken for lunch and dinner. I must eat chicken either at lunch or at dinner and then during the other meal I can have a different lean meat. 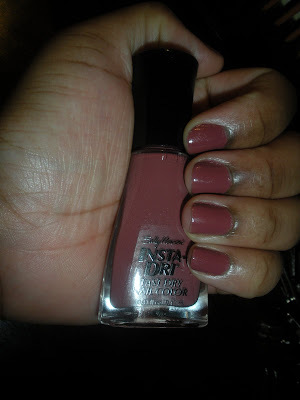 This color is Expresso, another member of the Sally Hansen Insta Dri collection. You may have heard rumors about the show The Game being cancelled. You may have even seen the popular youtube video with the actors from the show asking for support from the public. From what I understand, The Game has always received good ratings so why would a show like that possibly be cancelled when so much garbage is still on tv?????? i got rare minerals as a sample from sephora. i wasnt that impressed. it was decent and i think it's something i might like with prolonged use but im pretty satisfied with what im using now. as for the game, i dont really watch that show. ive seen a couple of episodes and wasnt too into it. doesnt mean it should go off the air, though. i know plenty of people who LOVE it. I looooooove Boris Kodjoe too! he's hoooot!! I kinda gave up on the Fat Smash (HA! Before I even started)...I'm far too lazy to go-by-the-book when it comes to health/fitness. Everyone who does it has nothing but great things to say about it. Good luck!! The Game....I don't know how I started watching it but the acting is pretty terrible. I watch it only because I want to see what's happening next. Shows like that don't last long. They've got that UPN-appeal and we all know what happened to those shows. OR UPN in general....lol! I like the show's concept but they need to pump it up in the production area. Thanks for the great reviews. It is interesting how we find some great movies unexpectedly. I love that. In regards to the Game, it was a good fun show to watch. Although it wasn't a must see for me. Good luck on your diet keep us posted! They always cancel the really great shows on TV. I'm sure if they are thinking about cutting the Game they will do it. I try not to get to attached to shows because they really are a gamble with these tv networks! As for moisturizers I need some ideas on getting something that will control the oil on my face! arghh it's so hard keeping all that in check. If anyone can help me please tell me what a girl should do! hmm what exactly is "virgin soil?" i've always wanted to try rare minerals but ever since my bare mineral makeup days, i've vowed to stay away from bare escentuals. Awww...I like the Game. There really isn't another "black" show on that I like. is there another on? They got rid of Girlfriends now this. I saw her sister show only once Roommates...garbage. I need to read a book anyway. Antithesis what are you using now? B lol you are done already??? Just wondering you may want those blotting tissues I posted on a while back. Or get a matte moisturizer those wont give your oily skin additional oils. Jensmakeupbag seriously I dont know. I will only assume that virgin soil is soil that is not combined with chemicals etc. pure soil. Miss Yaya I udnerstand after all we are in a recession! thanks so much for reading everyone. Sadly I feel the same way about The Game. However, it's been on the list of shows to be canceled numerous times despite its good ratings. D.A true-thanks for your comment.